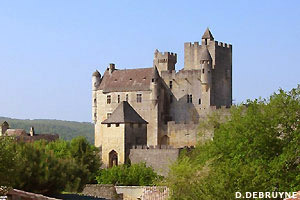 It is undoubtedly since the course of the Dordogne that the fortress appears most impressive. Perched on an inaccessible rock piton that it seems to prolong in the same vertical dash, it draws up its high silhouette above the small commune Beynac-and-Cazenac. It defies since centuries its rival planted on left bank of the river: the place of Castelnaud.